– The story of a very Italian company. The brand and its collections reflect a time-honoured culture which has become a collective treasure. At the heart of the story lies the elegant ideal which Fope pursues every day, creating exquisite designs in its own understated, unmistakable style. Umberto Cazzola opened his first goldsmith’s workshop back in 1929, eventually passing on his innovative, pioneering approach to his son Odino. The company specialised in making watchstraps from gold and other metals, becoming suppliers to Switzerland’s biggest watchmaking brands. When the third generation joined the family firm, Fope poured its vast wealth of expertise into making its own gold jewellery collections. It created the Novecento mesh, shaping it into many different designs: the brand’s signature style brought it success in Italy and, later, world-wide. The family’s fourth generation helped Fope earn a permanent place in the international jewellery market, where it stands out as a symbol of the elegance and quality of Made in Italy. Inspiration comes from city architectures, a perfumed garden or a melody played casually on the piano. A real setting which includes people, work and love, and an endless source of emotions. 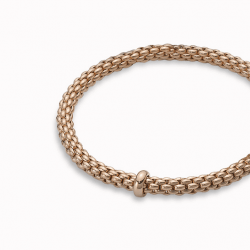 Eka – meaning ‘one’ in Sanskrit – is a whole new way of wearing gold bracelets.Based on one of Fope’s inventions from the 1950s, it applies the concept of flexibility to jewellery, blending together luxury and innovation. With its classic gold mesh design reworked in ultra-contemporary style, Flex’it has proved an instant global success. The Lovely Daisy collection of gold jewellery is as light and romantic as a flower worn in your hair. 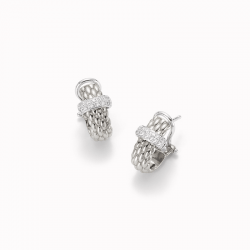 Evoking happy memories of your first ever piece of jewellery, it was created for women who already wear Fope and all those who’ve always dreamed of it… This original new take on the iconic Novecento mesh is delicate and ever-elegant, designed to be worn without a care in the world. The Solo collection brings a new contemporary slant to Unica, the brand’s best-selling range in the Nineties. 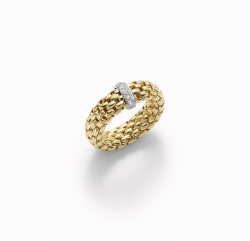 The bracelet’s gold mesh is now flexible, the proportions are slightly smaller than the thicker chains in vogue at the time, and there are numerous new versions with gold loops, pearls and diamonds in different carats. The matching set also includes chokers, chain and tassel necklaces, earrings and rings. 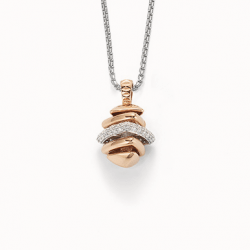 FOPE presents a new original 18-carat gold collection, whose fine and smooth chain is the result of exclusive technologies. The design represents a luxuriously minimalistic version of the iconic Novecento mesh, as revealed by the typical “links” that are the brand’s signature. The MiaLuce collection is the jewel in Fope’s crown, the very pinnacle of all the brand’s current creations. The bracelet and necklace are crafted using Flex’it technology, and the complete jewellery set exudes all the elegance and opulence of classic Italian design. MiaLuce is exceptional both for its style and delightful wearability, all finished off with the instantly recognisable flair of the Fope brand.